Separating contaminated laundry from disinfected laundry by making use of integrated hygienic barrier machinery. Lapauw International is the European manufacturer of ecological laundry machinery and provides a total laundry solution for all kind of collectivities: Hotels, Hospitals, Cruiseships, Railway's, Automated Laundry businesses, Textile manufacturers etc. 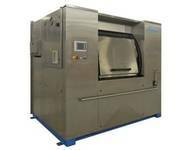 Lapauw International offers a wide range of washer extractors, washing tunnels, presses, dryers, tunnelfinishers and is worldwide known for its full range of flatwork ironers (gas- or steamheated) complete with feeders and folders. Hygiene and disinfection are not just a must, but a requirement in healthcare. This is why, with its Pullman series, Lapauw offers the washing machines you need to keep your project within the strictest standards of hygiene: these machines are aseptic, allowing you to keep the clean zone separate from the dirty zone. The Pullman Medicare is the Lapauw solution for the health care industry. With 2 and 3 pockets, the Pullman Medicare Washer-extractor not only is a washer for hospital laundries, but the 2 pockets offer the flexibility that is sought of by private clinics and homes for the aged. The Trolley Wash is a desinfection cabin for Trolley's.